The Cambridge, Maryland hotel and resort offers special events & activities, August 15th – 29th. Learn to catch, crack, and cook up your own crabs during daily demos by the pros, savor daily crab specials, as well as crab pairings. 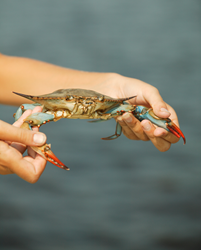 Summer on the Eastern Shore wouldn’t be complete without succulent Maryland blue crabs, and Hyatt Regency Chesapeake Bay Golf Resort, Spa and Marina’s Fifth Annual Crab Week, August 15-29, pays homage to the time-honored dining tradition with two full weeks of crab-happy festivities. In addition, guests can enjoy a third night free when booking the resort’s Sunshine on Sale package. Culinary highlights of crab week start at check-in for overnight guests, who receive a complimentary gift of Old Bay seasoning. Savor crab specialties whipped up by food truck sensation, Feelin’ Crabby, and enjoy an exclusive tour and feast at J.M Clayton Company, the world’s oldest crab house. Watch – or participate – in the resort’s annual crab cake eating contest. Learn to catch, crack, and cook up your own crabs during daily demos by the pros, savor daily crab specials, as well as crab pairings. After feasting on crabs, swing into action during River Marsh Golf Club’s Crabby Cup, a nine-hole golf tournament. Join author/illustrator Chris Raschka for a special reading of his book, Crabby Crab. Kids love sinking their claws into arts & crafts at Krusty Krab’s Kreative Korner, competing in marine animal pool races and other crab-inspired games, and watching favorite movies while floating on water. Click here for a full schedule of activities. Crab Week guests staying under the Sunshine on Sale package receive a third night free, when staying two nights at regular rates, as well as free daily breakfast for two. Overnight rates start at $359 per night during the summer season. Sunshine on Sale is available through December 30, 2014, and is based on double occupancy, subject to availability. Taxes and resort fee additional. Reservations must be made in advance. To book this package, please call 800.633.7313 or visit chesapeakebay.hyatt.com. The Hyatt Regency Chesapeake Bay Golf Resort, Spa and Marina is the premier four-diamond resort of the Chesapeake Bay. The property is nestled on 342 magnificent acres along the Choptank River, and features 400 luxurious rooms and suites. Among amenities are six superb dining options; an award-winning, 18-hole championship golf course; the 150-slip River Marsh Marina; the Sago Salon & Spa; multi-level indoor and outdoor swimming pools; a fitness facility, and a children's recreation center. For more information on the Hyatt Regency Chesapeake bay, please call (800) 633-7313 or visit chesapeakebay.hyatt.com. Follow Hyatt Chesapeake Bay on Facebook at facebook.com/hyattchesapeake; Twitter @hyattchesapeake; or Instagram #HyattChesapeake. Hyatt Regency encompasses the full spectrum of hotel types, which are conveniently located in urban, suburban, airport, convention and resort destinations around the world. Properties range in size from 200 to more than 2,000 rooms, feature intimate and large meeting spaces, and offer a full range of services and dining options tailored to serve the needs of conventions, business travelers or resort vacationers. Hyatt Regency enables all guests – whether they are traveling to work, unwind or gather in celebration – to feel productive and revitalized. For more information and reservations, visit hyatt.com.